SureReplica is Veeam’s technology that lets you test a VM replica for recoverability. To ensure that the VM replica is functioning properly, Veeam Backup & Replication performs its “live” verification. Veeam Backup & Replication automatically boots the VM replica from the necessary restore point in the isolated environment, performs tests against the VM replica, powers it off and creates a report on the VM replica state. The SureReplica technology does not require the vPower engine. A VM replica is essentially an exact copy of a VM with a set of restore points. The VM replica data is stored in the raw decompressed format native to VMware. Therefore, to start a VM replica in the virtual lab, you do not need to present its data via the vPower NFS datastore to the ESX(i) host. 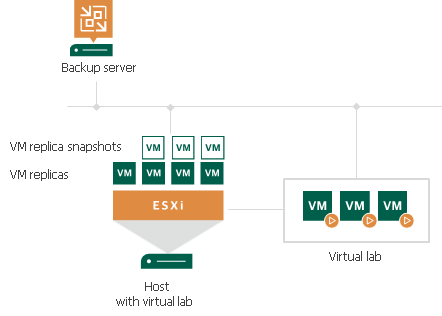 Veeam Backup & Replication re-configures the VM replica settings for recovery verification, connects the VM replica to the isolated virtual lab and powers it on. As there is no need to publish the VM from the backup file, the SureReplica processing is typically faster than SureBackup. Subsequently, the U-AIR and On-Demand Sandbox operations are faster, too. Veeam Backup & Replication triggers a VMware snapshot for a VM replica. The snapshot protects the VM replica from changes while it is running. All changes made to the VM replica are written to the delta file. Veeam Backup & Replication starts the VM replica in the virtual lab. Veeam Backup & Replication performs tests against the verified VM replica. When the verification process is over, Veeam Backup & Replication removes the delta file of the VM replica snapshot, powers off the VM replica and creates a report on its state. The report is sent to the backup administrator by email. Veeam Backup & Replication verifies only VM replicas in the Normal state. If a VM replica is in the Failover or Failback state, the verification process fails. When Veeam Backup & Replication verifies the VM replica, it puts the VM replica to the SureBackup state. You cannot perform failback and failover operations for a VM replica in the SureBackup state until recovery verification or the U-AIR process is over and the VM replica returns to the Normal state. Application group. During recovery verification, the VM replica is not started alone: it is started together with VMs on which the VM replica is dependent. Starting a VM replica in conjunction with other VMs enables full functionality of applications running inside the VM replica and lets you run these applications just like in the production environment. Virtual lab. The virtual lab is the isolated virtual environment in which the VM replica and VMs from the application group are started and tested. SureBackup job. The SureBackup job is a task for VM replica verification process. You can run the SureBackup job manually or schedule it to run automatically by schedule.